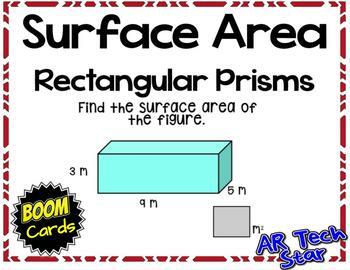 Engage your students with this set of 10 Boom Cards to practice how to find surface area. 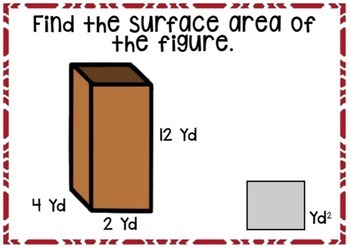 Students will calculate the surface area of a variety of rectangular prisms, then type the answer in a box. 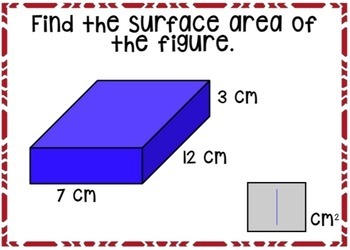 This is a great way to check for understanding of this very difficult topic. This set can be used independently, in centers, for interventions, or project it on to the board to use with whole group. great for whole group instruction, independent practice, homework, centers, interventions, early finishers, or even as quizzes! Click here for a playable preview of these cards. With your Teachers Pay Teachers purchase, users new to Boom Learning get a three-month free trial of student progress reporting for up to 150 students. Your trial includes the ability to make up to 5 free DIY decks. You may upgrade or cancel at any time. To use Boom Cards, you must be connected to the Internet. Boom Cards play on modern browsers (Chrome, Safari, Firefox, and Edge). Apps are available for Android, iPads, iPhones, and Kindle Fires. For security and privacy, adults must have a Boom Learning account to use and assign Boom Cards. You will be able to assign the Boom Cards you are buying with "Fast Pins," (play provides instant feedback for self-grading Boom Cards). Fast Play is always a free way for students to engage with Boom Cards decks. For additional assignment options you'll need a premium account. If you are new to Boom Learning, you will be offered a free trial of our premium account. Read here for details: http://bit.ly/BoomTrial. Boom Learning℠ and Boom Cards™ are the trademarks of Boom Learning, Inc. Used with permission. I hope you and your students enjoy these Boom Cards! Please leave feedback and let me know what you think. Click the green star to follow my store and be the first to know about new products.